Use the multi-information display to customize certain features. Press and hold the button for a few seconds while the ignition switch . To customize other features, press the button. Customization is possible when you see the driver’s ID (DRIVER 1 or DRIVER 2) on the CHG setting screen. The driver’s ID indicates which remote transmitter you have used to unlock the driver’s door. 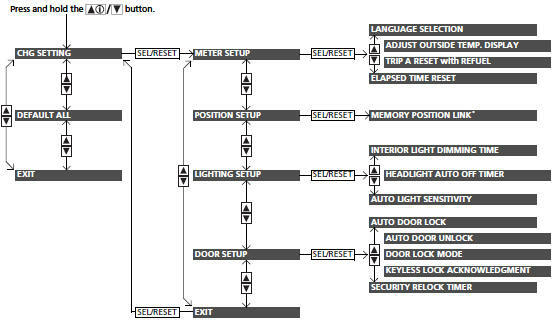 The customized settings are recalled every time you unlock the driver’s door with that remote. The steps for changing the TRIP A RESET with REFUEL setting to ON are shown below. The default setting for TRIP A RESET with REFUEL is OFF. 1. Press and hold the button until CHG SETTING appears on the display. 2. Press the SEL/RESET button to go into the METER SETUP group. 3. Press the SEL/RESET button again. - LANGUAGE SELECTION appears first in the display. 4. Press the button until TRIP A RESET with REFUEL appears on the display, then press the SEL/RESET button. - The display switches to the Customization setup screen, where you can select ON, OFF, or EXIT. 5. Press the button and select ON, then press the SEL/RESET button. - The ON setup screen appears, then the display returns to the Customization menu screen. 6. Press the button until EXIT appears in the display, then press the SEL/ RESET button. 7. Repeat step 6 until you return to the normal screen.